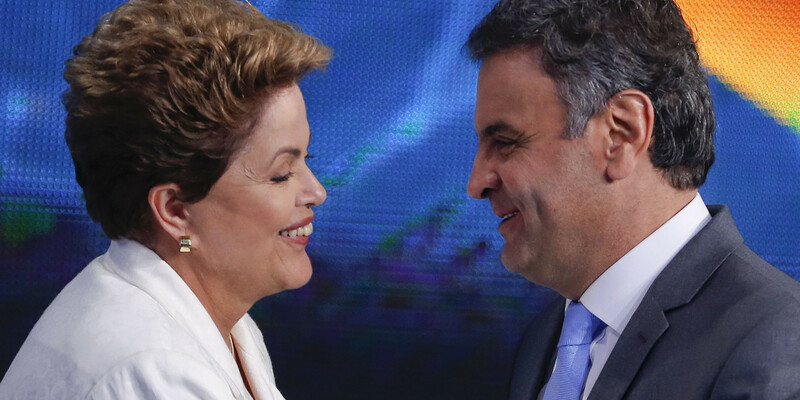 Dilma or Aécio, who will have the last laugh? A new Datafolha poll came out today (October 20), showing Dilma Rousseff in the lead again 46 to 43 percent against her opponent Aécio Neves. 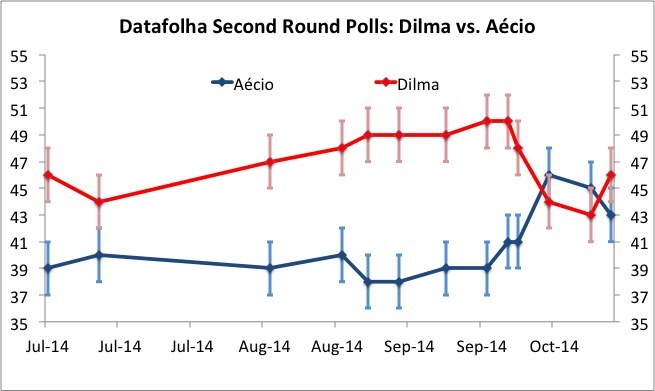 This means a turnaround from the previous poll last week that had Aécio up by two, 45 to 43 percent. These results, however, remain within the margin of error (plus or minus two percentage points). Another (though in my view lower quality) poll conducted by MDA, also had Dilma ahead marginally by one percentage point. The turnaround seems to be related to a shift in Dilma’s approval rating: 42 percent see it positively, the highest rate since the protests of June 2013 took a heavy toll on her popularity. Only 20 percent give a negative evaluation (the rest rates her performance as “regular”). Further, the rejection rate of Aécio Neves increased, with 40 percent declaring they will not vote for him under any circumstance (38 percent last week) and now exceeds Dilma’s (39 percent). All of this seems to indicate that the incumbent’s strategy of self-appraisal and mudslinging is working. Does this mean the election is decided? De jeito nenhum (hell no!). It remains to close to call, and it is hard to judge the quality of a poll that was apparently conducted in one single day. Moreover, there are still six days to the election and the number of undecided voters remained unchanged (6 percent) enough to swing it either way. The result does however broadly support my view that Dilma remains the favorite due to the incumbency bonus, strengths of the PT brand (Lula!) with lower class voters and the vulnerabilities of Aécio Neves and the PSDB. As of right now (Monday night, 8 pm Brasília time) I say the odds are 60:40 for Dilma. What do you think? Participate in our poll below and share your opinions in the comment section….